A Green Party Member of the Scottish Parliament has pledged to take forward a bill that would cut the default speed limit for built-up areas across the country to 20mph. A proposed ‘Member’s Bill’ from the Scottish Greens’ environment spokesperson, Mark Ruskell MSP, would replace the current 30mph default speed limit on restricted roads in Scotland with a 20mph limit. 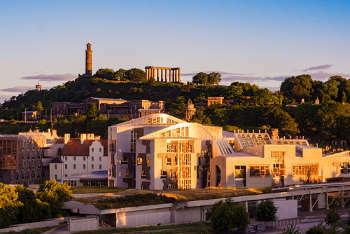 Mr Ruskell secured the right to bring forward the bill with the support of 12 Scottish National Party MSPs, seven from Scottish Labour, five from the Scottish Green Party and one Scottish Liberal Democrat. He and other Green Party MSPs took part in Pedal on Parliament (PoP) events in Edinburgh and Inverness at the weekend, calling for ‘safer streets with lower speed limits, and investment in cycling and walking routes to prevent ill-health’. He said: ‘Momentum is growing for slower speeds to create safer streets which encourage more walking and cycling. The thousands of people from all walks of life expected at today's Pedal on Parliament events can add their voices to the broad public support that already exists for dropping the urban speed limit from 30 to 20 mph – it’s already one of PoP’s eight manifesto asks. ‘Along with public support, and that of the leaders of Scotland's two biggest city councils, we have support from the OECD and the World Health Organisation for 20 mph to become the appropriate speed limit where walkers, cyclists and motor vehicles mix. ‘Scotland has a chance to build on the success of efforts in Edinburgh, Fife and Clackmannanshire in rolling out a safer limit on streets where we live, work and play.